The Christmas tree is all dressed, the fireplace is warming the saloon and I'm enjoying the calm as my dear family now is fast asleep. This is a nice contrast to the last couple of days of inspiring but intense activities. This weekend we moved from the hectic big city pulse of Stockholm to the calm woods of Bergslagen. Me and my beloved wife Therese are now changing course in life to focus even more on Jonas Vildmark and the outdoors. As a natural step in our business development we have been looking for a suitable homestead for some time now. 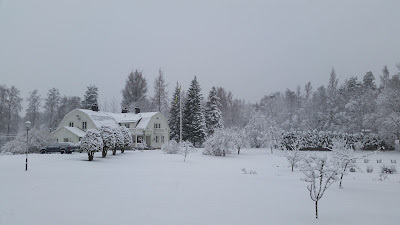 And now we have gotten the opportunity to live in the beautiful villa Lienshyttans Herrgård in Riddarhyttan Sweden. This shift is a wonderful final to a fantastic year for us and Jonas Vildmark. 2016 offered inspiring events like; Vildmarksmässan 2016, Ystad Täljfestival 2016, Naked and Afraid, Bushcraftfestivalen 2016, nice courses, a lot of hunting, buying forest in Hälsingland and last but not least; getting to buy the inspiring place Lienshyttans Herrgård. With these words from a quiet and frosty Riddarhyttan I want to wish you and your dearest a peaceful Christmas and a Happy New Year! The Jonas Vildmark plans for 2017 will for instance offer you news like; Hunting School, Bushcraft weekends, lectures at the Vildmarksmässan, exciting homesteading and the Bushcraftfestivalen 2017. Hope to see you soon. Take care of each other during the upcoming holidays and let your heart be generous to those in need.